Google App for iOS now suggests its users the related articles based on the content they have read on their device. This feature is currently available only in the US region and it will be expanded to other regions of the world very soon. How to find the recommended articles on Google for iOS app? If you want to get a recommended article after you finish reading your current article, you will have to just scroll back up. By doing so, the app will display a list of articles that are related to the one they have just finished reading. 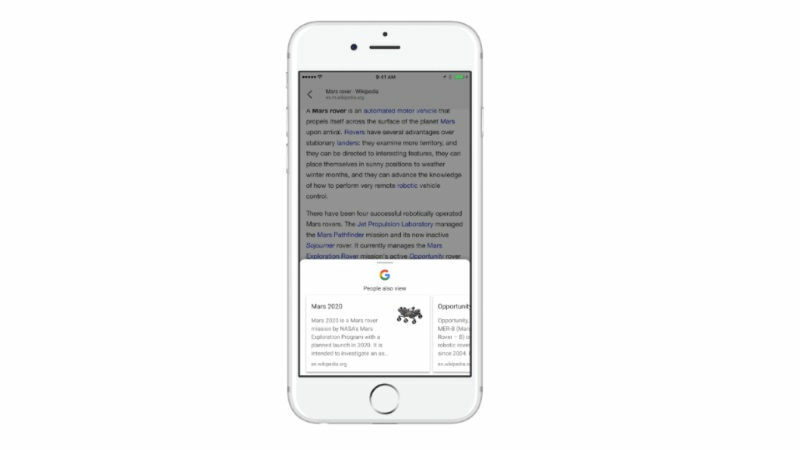 Starting today, while you’re reading a web page on the Google app for iOS, you’ll see suggestions for related content when you pull up the bottom of the page-no need to type anything into the search box to learn more. Suppose you’ve just finished reading an introductory article about the Mars rover. When you start scrolling back up, you’ll see additional articles on this topic that may interest you, like upcoming Mars missions or an in-depth story about the rover exploring a gully that might’ve contained water. Alternatively, if you’re reading a recipe for roasting shishito peppers, you’ll be able to jump straight to other ways to prepare them, such as grilling them, with a single tap. Is your Google account 15 GB free space full? Here are a few tips! This is definitely going to help the bookworms and the voracious readers to read more and more based on their interests. We can expect this feature to be welcomed with both hands by them. Once it is available in all the regions and on all platforms, we can also expect a huge rise in the level of reading across the globe. However, let us know your views in the comments section below.